Before I start on all of the bad stuffs, let me just brag about the good for a minute, if just so that this image is the first (or, um, second, after my creepy eyes in the banner above) that is seen when this post is published. 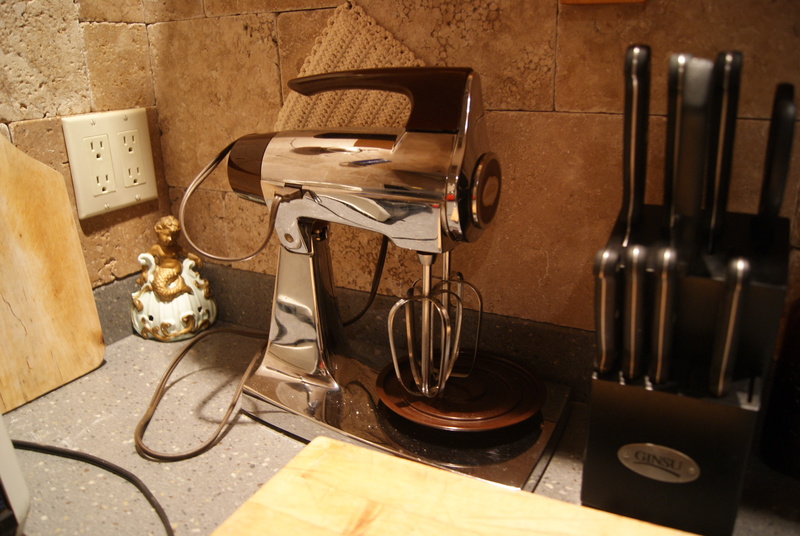 This is THE stand mixer my boyfriend gave me for my birthday. It’s beautiful, and I teared up a little bit. Isn’t it beautiful? Sweet Jeebus, it is. I can’t. I can’t even. I’ve almost forgotten the bad. The bad…bad…oh wait. Well, this is a blog about a sad lady baking, so I guess you came here knowing what to expect. Or, at least, I hope you did. The cake I’m going to talk about today is one I actually made about three weeks ago, but I’m still catching up on a bunch of things, including writing this very blog, so forgive me, please. Or don’t forgive me and run away. You’ll miss a concert featuring the tiniest violin, but that’s your loss I guess. YOU GUYS. Seriously, I am in such a funk that I can’t even talk about it. The good thing (for this blog, at least, since it’s been pretty bad for my waistline 😦 ) is that I’ve kind of been baking like a madwoman to attempt to reverse the effects of said funk. You can see how well this has been working, I’m sure. I guess that ever since my birthday I’ve been evaluating and examining what I’ve been doing with myself, and it’s getting me down. I suppose I’d hoped to feel more…capable by this age, and I don’t. I have no idea what to do with my life, peoples. Any and all suggestions (except ANY involving Stamos, ugh, gross) would be welcomed with open arms. Oh, also, do you know what I just realized? I have no idea what my favorite cake is! How the hell does a person who runs a baking blog not know this? How have I lived my whole life this way? It makes no sense. Do I just not like cake? Isn’t that something you should just be able to kind of recall? I find this very strange. Why am I choosing now to talk about this? Well, around my birthday I got the lame idea to sit in my kitchen and feel sorry for myself by baking myself a cake. But then, I realized I didn’t know what it was I wanted. Story of my life, kids :(. Sigh. Anyway, I decided to just make something, so I pulled a recipe for a Double Chocolate Hot Fudge Sundae cake out of my favorite flipping recipe book ever. Thank you, Betty. Thank you even just for the name of this cake. Let’s get started, friends. Ok, another amazeballs thing about this recipe is that it is made directly in the pan, which means if you’re feeling lazy and kind of sad and zombie-like these days (ahem), there won’t be much for you to do in the way of clean-up. Yay! 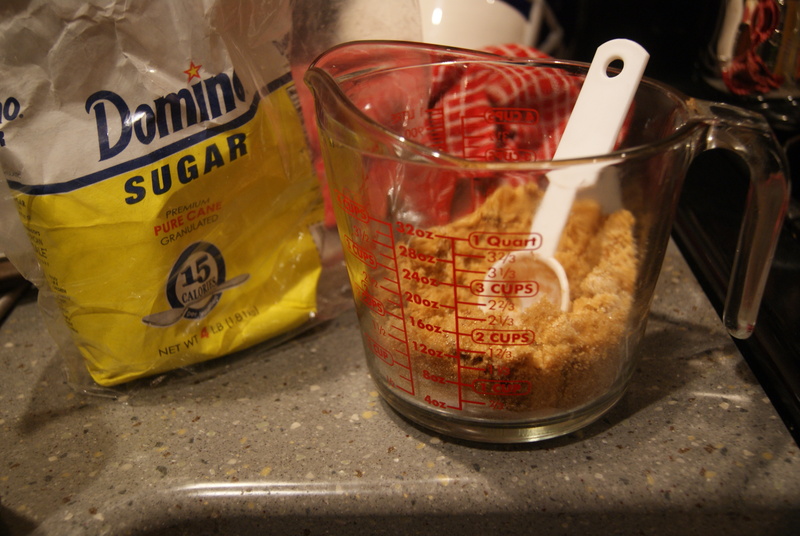 Oh, also, did you know that you could sub two tablespoons of molasses for every cup granulated sugar for a cup of brown sugar? This is something I needed to know as my stash of brown sugar was gone (tragedy). Take a look (but do a better job mixing the two together than I did). So, preheat your oven to 350°F. Now, in a 9×9″ un-greased square pan, mix your flour, granulated sugar, 2 tablespoons of cocoa, baking powder and salt together. 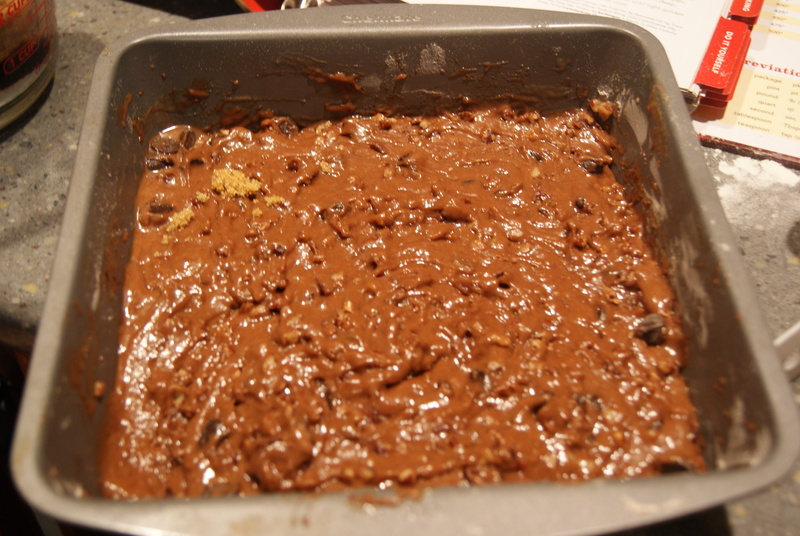 Stir in milk, oil and vanilla until the batter is smooth, then fold in nuts and chocolate chips. 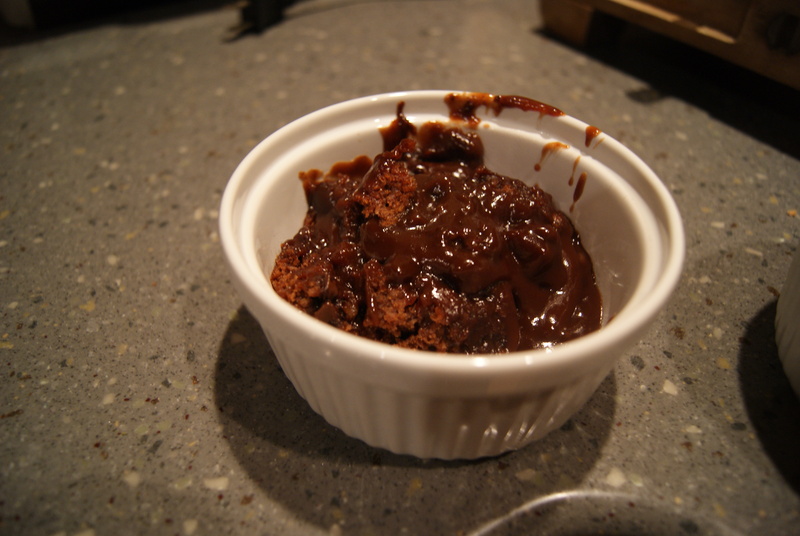 Sprinkle the 1/4 cup of cocoa powder and cup of brown sugar evenly over the top, and then pour hot water over the mixture. Send the pan into the oven for 40 minutes, or until the top is dry. Let cake cool for about 5 minutes, then scoop into dishes and top with ice cream if you’ve got any (I didn’t have any! The hits just keep on coming!). Now, while I enjoyed this cake warm, I freaking overdosed on it cold. It is amazing after a day in the refrigerator. I suppose it’s just easier to appreciate all of the different textures of the cake when it’s cool. I like to tell myself that that is why I kept visiting this cake in the fridge…to appreciate it. So, is this my favorite cake? No, no it is not. I will certainly be making it again, but the search continues for the one cake that will solve all of my many problems (yup, I took it there). Stay tuned, readers.